No need to plan your cruises around the pumpout system. Air Head Composting Toilet will simply and efficiently deal with all of your waste for the length of your week long cruise. Confused about the myriad of parts such as:Â valves, pumps, hoses, clamps, toilet, tank, vent ports, etc.Â that are necessary for installation of a holding tank? The Air Head Environmental Toilet is a complete all-in-one unit for much less than the cost of a holding tank system. The solids tank may hold enough solid matter for an entire season’s boating. This surprising ability to hold so much in so little space is due to the absence of additional liquids and the product’s ability to break down the matter. 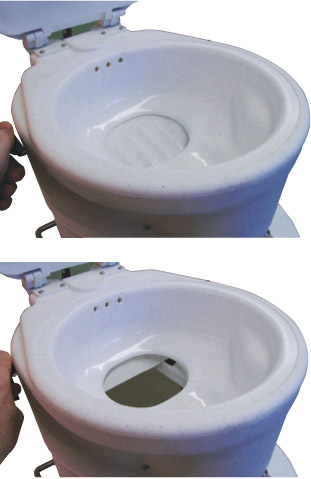 For weekend use the Air Head Composting Toilet will contain approximately 80 uses. Holding tanks sized for most small and medium sized boats are so busy storing flush water that they cannot accommodate nearly as much waste. Our system renders solid matter odorless. How many marine sanitation systems can make this claim? Does your system have stinky hose syndrome? Flexible hoses are bound to smell over time. Don’t replace the hose. Get anÂ Air Head Composting Toilet instead. Holding tank systems require remote tanks that usually fit under the forward bunks, (v-berth). This eliminates valuable storage space. The Air-Head is self contained. Everything happens directly beneath the toilet seat. Of course the advantage goes beyond the space savings, since there is a certain peace of mind that goes withÂ not having 20 odd gallons of waste sloshing around under your bed as you try to sleep! Emptying liquid human matter is easier thanks to Air Head’s “no chug-a-lug” design. Contents empty smoothly into any standard commode. The bottle accommodates approximately 12 pounds, in a discreet handled container. Compare this to the difficult and embarrassing chore of hefting a full 28 pound portable toilet back to shore! The Air Head Environmental Toilet does not depend on a 2″ pipe to flush waste like most marine plumbing. In fact there is nothing that can clog in our product. Standard marine heads have rubber parts that wear and oxidize over time. When these rubber parts break due to wear, the unit has to be taken apart, exposing you to contamination as a result of passed sewage — not a pleasant experience. The Air Head Environmental Toilet is simple and it uses no moving rubber parts, all of its parts are environmentally stable so it is likely that no maintenance other than emptying and external cleaning will be required for years. Why pay $100 dollars or more for an active vent for your boat when Air Head’s integral fan acts as a vent? Our system works with nature — it uses no harmful chemicals. The Air Head Dry Toilet is predictable and reliable. With so many complex systems of your boat, it’s refreshing to have one less thing to worry about. Save the rocket science for the radar! You can own an Air Head Dry Toilet for a fraction of the price of a entry-level holding tank system.